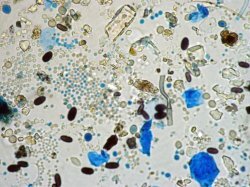 The objective of trapping and enumeration of air-borne fungal spores in indoor environments may be 1) to determine the load of allergenic spores and their composition, 2) to determine whether there were hidden sources of fungal amplification, 3) to assess the effectiveness of remediation. Regardless of the objective, the methods of trapping and enumeration are the same. Generally fungal spores are trapped by impacting air onto some inert media or some suitable growth agar media. 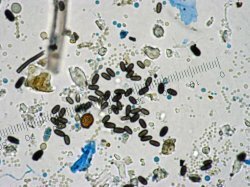 Enumeration of fungal spores trapped on inert media is performed by direct microscopic examination without culturing. This is referred to as total fungal spore count or non-viable analyses. When air is impacted on growth agar media any fungal spores or hyphal fragments that can germinate on that media develops into colonies (often referred to as colony forming units) that are then enumerated and identified if necessary. Fungal Spores Trapping for Total fungal Spore Counts (Non-viable). The common air samplers for total fungal spores counts are slit and circular type of samplers. Slit samplers include Air-O-Cell, BioCell, VersaTrap, Allergenco, BioSis, and Burkard. Examples of circular samplers include Cyclex, Cyclex-d and Micro-5. These samplers (cassettes) are attached to a pump that can draw air at the rate recommended by the manufacturer of the cassette. The Air-O-Cell cassettes are opened in the laboratory by cutting around the sealing band. The glass cover slip (containing the sample trace) is removed and slowly placed at an angle with the media collection side facing either upwards or downwards. If the glass cover slip is to be placed with the media facing down, one to two (1-2) drops of lacto phenol cotton blue is placed in the center of the microscope slide before placing the glass cover slip. The edges of the cover glass can then be secured with a drop of nail polish. If the cover glass is to be placed with the media collection side facing up, it can first be secured with nail polish and then 1-2 drops of lactophenol cotton blue is placed in the middle of the sample. A second clean cover glass is then placed to cover the sample collection media and spread out the stain. Care should be taken not to trap air bubbles as these could interfere with the analyses. The sample deposition trace is identified at lower magnification (10X or 20X) objective and spore counting is performed at a minimum magnification of X400. There has been a lot of debate as to what magnification should be used during identification and enumeration. Some analysts have recommended use of 100X oil immersion. However, it’s important to note that use of 100X objective with oil can be very messy and in most cases may not add quality to the results. 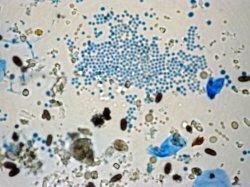 In our opinion, the most important considerations when it comes to spore enumeration and identification are a good quality microscope and a well trained analyst. In the past laboratories were using a variety of methods to analyze spore traps. This made comparison of results (and even terms used in the reports) difficult. The ASTM International has now released a new standard “Standard Test Method for Categorization and Quantification of Airborne Fungal Structures in an Inertial Impaction Sample by Optical Microscopy”. While this standard may not resolve all limitations of spore traps it will ensure that labs that use the standard analyze samples in a similar manner. The standard, however, may not improve the precision or accuracy of results, since, as it’s stated in the standard itself “…the detector in this method is the analyst, and therefore results are subjective, depending on the experience, training, qualification, and mental and optical fatigue of the analyst”. Enumeration and Identification of Fungal Colony Forming Units. Colony density: If there are too many colonies, they tend to merge and this makes counting very difficult and inaccurate. Counting is easier in some media such as dichloran 18% glycerol (DG18) agar which restricts the growth of colonies and significantly reduces the number of merging colonies. One drawback in using DG18 is that it can completely inhibit the growth of some fungi especially the hydrophilic species such as Stachybotrys and Chaetomium. Malt extract agar (MEA) is commonly used in indoor air quality surveys. MEA is a nutrient rich medium and has high water activity, which favors hydrophilic and fast growing species which may mask, inhibit or entirely suppress the growth of other fungi. Simultaneous use of MEA and DG18 is recommended since MEA supports the growth of a wide range of hydrophilic and mesophilic fungi while DG18 supports the growth of xerophilic and moderately xerophilic fungi. Therefore, use of MEA or DG18 alone may significantly reduce the number of species recovered. For air samples collected using Andersen and other similar samplers, the colony count is adjusted (positive hole correction) before calculating the number of CFU per cubic meter of air. This adjustment is however not performed for air samples collected using the Reuter Centrifugal Sampler (RCS). Sampling for Airborne Mould: When Should One Use Viable, Non-viable or Both Methods? An air quality investigation may require determining airborne mould (spores and hyphal fragments) concentration. Air can either be sampled onto some growth media for culture analysis or on a sticky surface or a filter membrane for direct microscopic examination. It is sometimes debated as to whether one should take non-viable samples, viable samples or a combination of the two. Either method can be used without the other or both can be used together (at the same time) depending on the objectives of the investigation. Due to lack of standardization some terminologies used in air sampling are technically incorrect or misleading. Let’s discuss these terms first. “Non-viable air samples” refer to samples that are taken on some sticky media or on a filter membrane or tape and subsequently examined directly under a microscope for enumeration and identification of mould spores and hyphal fragments without culturing. In other words, the samples are taken for analyses by direct microscopic examination (DME). Results are presented as a listing of various categories of moulds and the corresponding number of spores or hyphal fragments per cubic meter of air (Spores/m3). This term is technically inaccurate since viable and non-viable propagules are indistinguishable under the microscope and hence both are enumerated. “Viable air samples” refer to samples that are taken on some growth media and subsequently incubated for mould propagules (spores and/or hyphal fragments) to germinate and form colonies. The resulting colonies are then enumerated and/or transferred to other media for identification to genus or species. Results are presented as a listing of the recovered moulds and their corresponding number of colony forming units per cubic meter of air (CFU/m3). That is, the analysis of viable air samples involves culturing. The term is also technically inaccurate because some (sometimes most) of the propagules impacted on the growth media may not germinate not because they are not viable but because of the selectivity of the growth media used, competition from fast growing moulds or that some moulds can only grow on living hosts. When should one use viable, non-viable or both sampling methods? The easiest way to decide on this is first to define the objectives of air sampling, data required from sample analysis and the questions these data are meant to answer. The objective might be broad or very specific. If the objective of air sampling was to have an idea of how contaminated the air is, then the data required would be total counts. Non-viable samples would then be the best to take because counting includes both those propagules that can grow on laboratory media and those which cannot grow either because they are dead or would not grow on the selected media. Non-viable sampling may also be selected when the objective of air sampling is to determine the total counts for airborne spores prior to and after remediation to assess the effectiveness of remediation. In this case viable air samples would not be necessary. 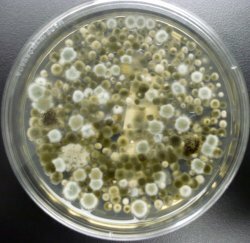 If the objective of air sampling was to find whether the air contains a specific species of mould e.g., Aspergillus fumigatus, then identification to species would be required. Since non-viable analysis would not distinguish A. fumigatus from other Aspergillus species and not even from Penicillium species and related genera, then sampling for viable analysis would be selected. For detecting a specific species, a selective media that would support the growth of the mould of interest would also be selected. If identification to species was required for a broad range of moulds, then media that support growth of a wide range of moulds would be selected. If the objective of air sampling was to determine the total airborne mould concentration and at the same time determine the proportion of viable propagules, then both sampling methods would be used. This would possibly be the case in hospitals where concern is not only the total concentration of airborne mould but also the viable species present. These are not the only reasons why one may sample for non-viable, viable or both non-viable and viable analysis. It all depends on the objectives of air sampling, the data required and the questions these data are intended to answer. Read Interpreting Numerical Data of Viable Airborne Mould Samples and Guidelines for Interpreting Numerical Data of Non-viable (Spore Traps) and Viable Airborne Mould Samples. To get hands-on experience on the application of these guidelines register for our Mould Training Seminars today! Do you have a question on mould? Send it to us at Contact US.